Although Cydia plays home to a large number of powerful, in-depth and awfully creative system based packages, the fact still remains that a lot of iOS device owners choose to go through the process of jailbreaking purely for the ability to modify and customize their iPhone, iPad or iPod touch to suit their own tastes and styles. Theming the device is extremely popular through WinterBoard activated interface assets, but it is also highly likely that the new Go Desk desktop rendering package will convince many users to also add some live home screen animations to their devices. We’ve seen packages uploaded to Cydia in the past that offer similar functionality. Tweaks and offerings like vWallpaper that allows video based wallpapers to be activated as well as the AquaBoard creation by Elias Limneos that brings rippling water effects to the display have all succeeded in giving some live animation effects to the home screen of iOS. However, Go Desktop is a continuation of that work and describes itself as a desktop rendering app that fully supports interactive animations and high-resolution wallpapers. One of the biggest compliments that can be paid to any tweak or enhancement is that it just works and does what it is meant to. 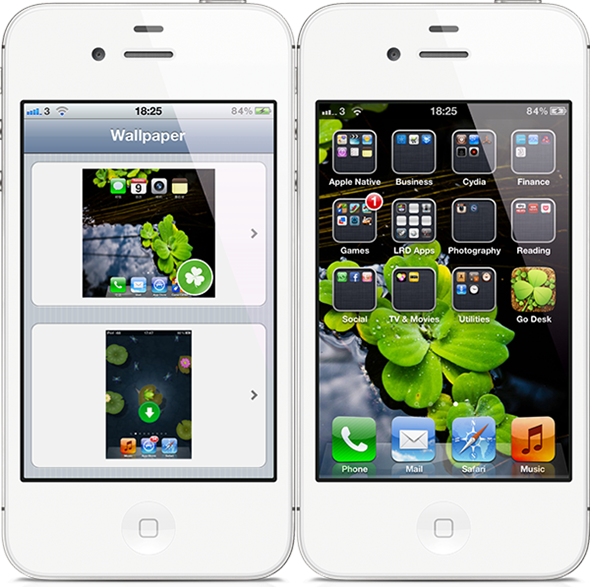 When installed, the default provided wallpaper scrolls perfectly when switching between active home screens and although the wall is entirely static, the scrolling feature gives the illusion of movement. The supplied desktop icon also makes it extremely easy to set your own wallpaper from the device’s camera roll and will work flawlessly with images above 1260×960 resolution. The creation of Go Desk will more than likely see a number of developers and artists producing animated themes that work with the package. The developer of the tweak has also taken the liberty of publishing the Go Desk Moonlight Pond theme as an additional download that offers a simple but entirely immersive animated pond scene onto the display of the jailbroken device. You can actually touch and interact with the wallpaper, which is pretty cool. It may be an idea that has been seen before and it may prove detrimental to the device’s battery in the long-run but it certainly adds personality to the device. The main Go Desk package is available as a free of charge download from the BigBoss repository and requires iOS 5.0 or above. 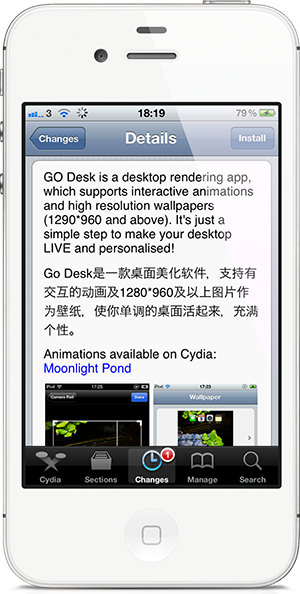 The accompanying Go Desk Moonlight Pond theme installs the Go Desk tweak as a dependency and is available through the BigBoss repository for $2.99.